« A Little Light Ahead? A quick note to inform everyone that the radiation treatment for my head tumor is a go! My last MRI (24 May) was the radiation oncologist’s deciding factor; he said the tumor was in a good position for the treatment. Ultimately, the goal is to destroy the tumor so my double vision will not return (yes, as well as get rid of the pesky tumor! ), and I can get off these dang steroids. One of the side effects I’ve had is a constant thinking about food and where my next meal is coming from. Talk about voracious! 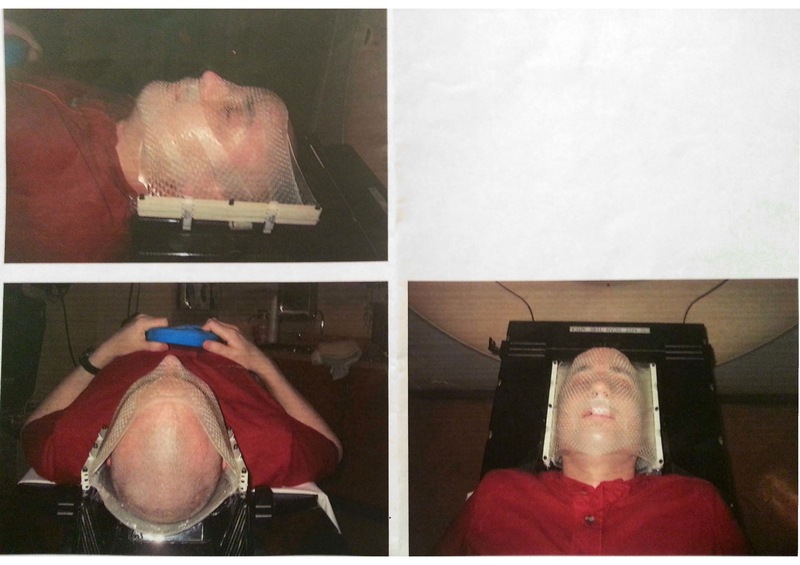 I had a head mold made last week for the treatment. Pics are attached. Basically, I laid still for a half hour while the team applied a warm polymer mold to my head that cooled and solidified. This will be used to keep me immobile during the actual radiation treatments. I’ll lay down and the machine will take over, bombard a very small target in my head to prevent collateral tissue damage and deliver the dosage based on the MRI and more CT data. It’s pretty amazing how it’s all calculated. I’m anxious to see how it all fits together. As mentioned, I will have 5 treatments. They start on the 12th and go through the 18th and will last 30 minutes each. The actual dosage is a 5 minute procedure; getting set up is what takes the most time. The docs have again reiterated the small possibilities of side effects and slight risks; but regardless of them, I’m pretty excited to get this thing dying soon! One (of many) things I’ve learned about cancer is that people can live, work, and exist with tumors in their bodies, which to me regarding cancer was a foreign concept. I’ve always thought that any kind of tumor was completely detrimental. But if they are kept in check, monitored appropriately and any new symptoms are quickly addressed, a good quality of life can be achieved. All that aside, any kind of tumors swimming around in near my brain still make me nervous, so onward with treatment! I’m still feeling good and going to work. The boys are out of school and Jenn is planning their summer. Ben is already signed up for two camps and Jack just wants to go to the pool all the time. Normality is creeping up on us and we’re reveling in it! Thanks everyone for keeping up. The responses to the last blog really reassured me that support for this is never ending and I am still humbled by it all. Going through it all without this tool would have been a much lonelier experience. I still have difficulty imagining anybody having to face it without some kind of link to humanity which to me is proof that people really care about others in distress. Thank you for your continued empathy in the responses. Have a great day! We’re all rooting for you up hear in VA. Regarding your pictures…so basically they just fitted you with a tailor made sleep pillow? That thing puts my infomercial purchased NASA-approved orthopedic memory foam pillow to shame. Keep up the great strides forward. Looks like you are suspended in a sequence from a SciFi movie. Your description sounds like a preparation for battle and indeed it is. Hope they kill that sucker also. Praying for the docs, technicans and all the care you get to make the cancer die and you “live long and prosper”!!! Think of all the great things we can do with your head mold after this is all over! We continue to follow every post and have prayed for you and your family in every European church we’ve entered (including St. Peter’s in Rome)! You’re never far from our thoughts. Let us know if you need anything from over here!! Looks like you are prepping to transform into a superhero!!! Which you already are really for the way you are handling/traveling this path! God Bless!! Hunter – in the great tradition of the old scientists you have taken cancer research to a new level by using yourself as the guinea pig! Enjoy your research when you feel well enough and keep on pushing! We can’t wait to get you back to West Point!! Everyone here still talks about you and how you were the best course director ever! I love how you make all your challenges and experiences a learning opportunity. Thanks for sharing them with us on your blog. Your progress is amazing, and you remain in my prayers always. Love consecutive good news posts! Keep ’em rolling! Hunter, that’s awesome and I can’t wait for that tumor to be gone…like I told you up at Vandy the other day, my dad’s tumor responded very quickly to this kind of treatment, so I’ll be praying the same for you. It is so good to see you up at the clinic now and I am always very encouraged by your wonderful spirit and attitude. You’re amazing. See ya soon. on June 7, 2013 at 9:19 pm | Reply Steele&co. Awesome. You are always on our minds. Our relay for life is tomorrow. I will be cutting hair for team proceeds and locks of love donations. This year we are walking for Team Hunter. I’m praying for this next round of treatment to KO this tumor! Give my love to Jenn and Jack.